Join The Chilluminati, in our seventh year, for a day and night of Goa, Psychedelic and Progressive Trance, and Ambient Soundscapes. Located in the heart of the Midwestern USA. We present an intimate 24 hours of music on one stage, fire performances, community workshops, Goa Trance Culture, and logical progression through the Midwest summer. SPACE IS LIMITED AND RSVP IS REQUIRED. This event will be considered “sold out” once all pre-sales are gone. 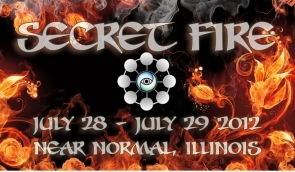 Secret Fire 2012 is an open-air Leave No Trace event. $30 registration fee per person, in advance only.